Not the first “talking motion picture,” The Jazz Singer nonetheless revolutionized Hollywood. Its public acclaim and financial success forced the established oldline movie studios to hastily adopt sound, something they had not pursued with any urgency until then. Different techniques had been under development since 1890, before the upstart Warner brothers, Harry, Sam, Jack, and Albert, staked their company on Vitaphone, a new 1920s technology that synchronized sound and film. The remarkable story richly echoes the life of the Warners and Al Jolson while also depicting the assimilation challenge facing so many recent Jewish immigrants. Samson Raphaelson, a Jewish student at the University of Illinois, wrote a short story, Day of Atonement, after seeing Al Jolson perform in 1917. He recognized the cantor-like styling of Jolson’s performance and may have known the perhaps apocryphal story of Jolson’s early life. In 1894, when he was eight, Jolson had immigrated to the United States from Lithuania with his parents, Moshe Reuben Yeolson and Naomi Etta Cantor. Legend had it Jolson’s father was a cantor who beat his son when Jolson performed popular songs in public and showed no interest in replacing his father as cantor. In short, Jolson was assimilating rather than following his religious and family traditions. Raphaelson’s story seemingly paralleled Jolson’s life. Jolson read Day of Atonement when it was published as a 1922 article in Everybody’s Magazine. He approached Raphaelson and various movie producers hoping to convince them to adapt the story for the screen. The studios were not interested in a “Jewish story,” and Raphaelson did not want his story to become the backdrop for a Jolson musical review. The notion appeared dead. Instead, Raphaelson turned Atonement into a stage play. 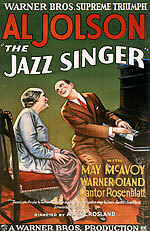 Renamed The Jazz Singer, it opened in September 1925 with George Jessel playing, Jack Robin (Jakie Rabinowitz), the lead. In the play, the father (Cantor Rabinowitz) and son (Jack Robin) are ultimately reconciled when Jack gives up his public career to take over as cantor for his dying father. In that version, the assimilation impulse and desire for secular achievement is overcome by a renewed commitment to Judaism. Over the course of its thirty-eight-week Broadway run, Jessel was so moved by the story, and his role playing Jack, that he reaffirmed his commitment to his own Jewish heritage. Jolson followed a different course. He lived the assimilated lifestyle. His four wives were all Gentiles, and he performed publicly on Yom Kippur for nearly his entire career. He became one of the era’s most popular entertainers. Among the genres in which he performed was “Jazz,” a term with a somewhat different meaning today. In the “Jazz Age” 1920s, “Jazz” spoke to a free style of up-tempo, lively, and sometimes primitive music pioneered by Southern blacks. Its popularity caused Caucasian entertainers, such as Jolson, to sometimes adopt “blackface” when performing “jazz” before vaudeville audiences. Jolson’s raw talent and his energetic and emotional (some would say “soulful”) style was unique for the times and he was very popular. 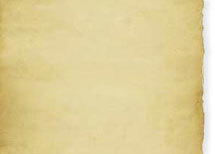 An international star, he was the first singer to sell more than ten million records. One Billboard archivist reckons Jolson had twenty-three No. 1 hits, over his twentynine- year (1911 to 1940) Broadway career. That would place him fourth, behind only Bing Crosby, Paul Whiteman, and Guy Lombardo for total No. 1 hits between 1890 and 1954. Like many of the early Jewish entrepreneurs who helped found today’s movie industry, the Warner brothers started small. Their father, a cobbler who barely made enough to keep the family fed and housed, could not stake them when son, Sam, wanted to buy a projector to show movies in different halls around Youngstown, Ohio. The brothers pooled their capital and eked out a living showing the occasional hot movie. After a time, they stopped moving from town to town and rented a single hall in Niles, Ohio. But before long, they decided they could make more money distributing movies (buying the movies and renting them to others) rather than just showing them. They also began producing their own movies. Both ventures had their ups and downs before the brothers bought the rights to My Four Years in Germany, a jingoistic anti-German documentary that sold well in post-World War I America. That movie established them as a small-time success. They set up a studio in Hollywood where Sam and Jack produced movies while Harry and Albert stayed in New York, helping finance the business and taking care of operations on the East Coast.